Do you like to keep it simple? If so, you likely won't want to get too elaborate when renovating your bathroom. A bathroom only needs a few select utilities. If you just want what's necessary, consider simply installing a traditional toilet, a shower stall and a pedestal sink. If you do want counter-space you may benefit from a bathroom vanity. These fixtures are available in a number of basic styles. Perhaps go with a classic black and white or wooden vanity. 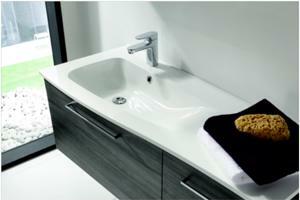 If you have a separate pedestal basin in the bathroom, this fixture does not need a sink. An article in The Wall Street Journal recently explained the process of building a vanity. Journal writer Alexa Brazilian described how she, uninterested by over-the-top vanities, wanted a basic space where she could put on her make-up and dry her hair. She realized that she could simply attach a three-sided mirror perpendicularly to a flat surface, such as a table, and create her own vanity. She noted that this is actually a very traditional idea, especially when laying out a decorative piece of cloth over the horizontal surface. "It wasn't until around the 1730s that mirrors were built into dressing tables. Mirrors were relatively small before then because the technology wasn't there," Nick Humphrey of the Victoria & Albert Museum told the Journal. These minimal vanities have a certain charm. Individuals designing their bathrooms might implement this idea, adding a practical yet distinctive feature to the room. Aside from the necessary fixtures, you may want the bathroom's layout to be minimal as well. Freshome describes how to stick to the basics without sacrificing the aesthetic value of the room. Instead of choosing an elaborate wallpaper or flashy color, you may simply want to simply paint your walls white. Overall, a black and white theme may instill a minimalist atmosphere in your bathroom. For the floor, you might decide on totally white tiles, gray stonework, or again, a mix of black and white. In terms of lighting in the bathroom, a basic overhead fixture may be enough. You might simply rely more on natural light flowing through the windows to be the room's source of illumination. By installing only necessary fixtures and keeping the room's decor minimal, you will create a basic and functional facility that is pleasing to the eye.